An ellipse is a shape that looks like an oval or a flattened circle. In geometry, an ellipse is a plane curve which results from the intersection of a cone by a plane in a way that produces a closed curve. 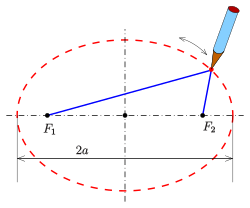 Circles are special cases of ellipses, obtained when the cutting plane is perpendicular to the cone's axis. An ellipse is also the locus of all points of the plane whose distances to two fixed points add to the same constant. 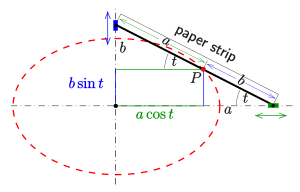 An ellipse and its properties. A circle has one center, called a focus, but an ellipse has two foci. An ellipse is simply all points on a graph that the sum of the distances from 2 points are the same. For example, an ellipse can be made by putting two pins into cardboard and a circle of string around those two, then putting a pencil in the loop and pulling as far as possible without breaking the string in all directions. The orbits of the planets are ellipses, with the sun at one focus and nothing at the other. 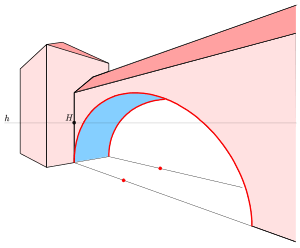 where the center of the ellipse is (h,k). 2A is the length from each end of the longer skinnier side. 2b is the length of the 2 ends of the short side. A²-B²=C² for c is the length between the foci and the center. Ellipses appear in descriptive geometry as images (parallel or central projection) of circles. So it is essential to have tools to draw an ellipse. Nowadays the best tool is the computer. During the times before this tool was not available and one was restricted to compass and ruler for the construction of single points of an ellipse. But there are technical tools (ellipsographs) to draw an ellipse in a continuous way like a compass for drawing a circle, too. The principle of ellipsographs were known to Greek mathematicians (Archimedes, Proklos) already. This representation can be modeled technically by this simple method. The axes and semi axes have to be known. Ellipse Facts for Kids. Kiddle Encyclopedia.